Just drop the sample onto the target and click the button. That's all there is to analysis. The instrument will perform sample mounting, measurement, and wiping. No need to move the wiper arm manually, nor wipe the liquid-contact parts with a cloth. Spectra measurement is conducted and the analysis data is obtained quickly. Analysis can be performed with 1 µL (pathlength: 0.2 mm) or 2 µL (pathlength: 0.7 mm) samples. The sample is dropped onto the target with a pipette. The optional 5 mm cell allows measurement of 5 mm path length. * If the surface tension of the sample is small, droplets might not be formed with a 1 to 2 µL sample. Basic operations can be conveniently performed by clicking icons in the software or function keys on the instrument itself. Analysis results can be converted to PDF or CSV files. All operations from sample mounting to measurement and wiping are automatically performed. Tedious operations are unnecessary. 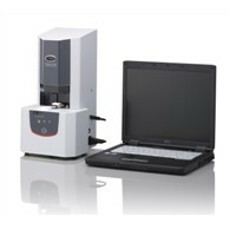 The Shimadzu BioSpec is a low-maintenance micro-volume spectrophotometer designed for the modern life science laboratory. It offers superior detection limits, up to 10 times better compared to the competition, making it the perfect instrument for quantitation of DNA, RNA, protein analysis, and photometric measurements. Find online auctions and classified ads for Shimadzu products and more on the LabX Marketplace. Browse ads and contact the seller directly or request a quote for more details. Buy and Sell Shimadzu Equipment and Accessories today on LabX!